Do You Need a “Ring of Security”? Home Automation is kind of like a sickness. First, you get a couple of light bulbs and you do party tricks like changing them from blue to green and then you realize that doesn’t solve a problem. But in the back of your brain, that little virus starts to fester and you realize that maybe there is a good use for them. Maybe being able to turn them on and off when you’re not home will make people think you are home. Perhaps you get a motion detector and the lights magically turn on when you walk in the room. Then you start thinking about HomeKit Scenes or maybe you want to play with IFTTT. You think, If I only had a smart thermostat, I could blink my lights when the temperature got too hot and send me a notification on my phone and I could trigger the fan so my dog doesn’t overheat. It starts small and pretty soon you’re one of us. At least one device that we can’t identify! There’s probably more, they seem to replicate like Tribbles! With this many automated devices, you’d think I’d be content. But there was one thing I’ve been wanting, a smart alarm system. Unfortunately, it was hard to articulate the problem it would solve. You see, we have a built-in alarm system from 1989 when the house was constructed. The stupid thing still works flawlessly! It’s like when your 720p TV won’t fail and you really want a 4K TV. The built-in alarm has sensors on all of the doors and windows, a keypad upstairs, downstairs and in the garage, and it lets off a heck of an alarm in the attic when we accidentally open a door when it’s armed. Side story about why that’s cool. We have a skylight on which crows love to crack things open. One time they had a large dog biscuit in classic the shape of a bone up there! The sound in the house is crazy loud and sounds like someone is in the house. One time Steve wanted them to knock it off, so we armed the house and purposely opened a door. Fixed our crow problem for nearly 10 minutes! The only thing this alarm can’t do is be remotely armed and disarmed. We had trouble justifying a whole new alarm system just for that one feature. We were, however, interested in having a monitoring service. We had never enabled that on the old one because it was enormously expensive. When we went through the Bathroom Remodel of Doom (TM Donald Burr), we realized there really was a problem to be solved. We gave our two main contractors access to our August lock so they could remotely unlock our door for the plethora of subcontractors, such as painters, plumbers, and drywall guys. But since we had a dumb alarm from the 1980s, we had to leave our house unalarmed for five months. Notice I didn’t tell you that back when it was happening? Momma didn’t raise no fool. I started trolling around for what all the cool kids were buying these days. I knew a few people who had opted for the SimpliSafe system and it looked pretty cool. The monitoring price still looked pretty high to us at $15/month. Since we’d never had monitoring before and hadn’t had a problem, it seemed like $180/year was pretty steep. I’m sure if we’d had a problem where monitoring saved us, $180/year would sound like pennies. But then I started hearing about how Ring had come out with an alarm system. Here’s why their system was more attractive for us. The business model of Ring is designed to slowly get you to give them all of your money. Let’s say you buy just a Ring Video Doorbell (the gateway drug). For no fee at all, you can always get motion detection, alerts when someone rings your doorbell, and view live video from your doorbell. You can even interact with the person at your doorstep from anywhere in the world. But for only $30/year, you can have motion and other interactions automatically recorded and view them later. $30 is peanuts, right? You love your Ring Video Doorbell, so now you decide to buy the Ring Floodlight Cam. Again you get motion alerts, and live video for free, but if you want to play back events later, that will cost you a second $30/year. You might start thinking, wait … that’s $60/year now… But if you really want the camera, you can shut that little voice up by saying, If the doorbell was worth $30/year, why wouldn’t the back yard camera be worth $30/year? And then you put in the Spotlight Cam Solar to watch your side yard and it turns out to be really easy to justify that $30/year fee. The reason the third $30/year is so easy to justify is that once you hit $100/year the cost never goes up. So at $90/year you feel like the next one you add will be free! That’s good, but it gets even better. If you get the Ring Alarm system, they have what they call the Protect Plus Plan. This is $100/year, gives you human monitoring, AND covers video storage of all of your other Ring devices. Since we have 3 Ring cameras already, that means we get humans monitoring our alarm for only an additional $10/year. See how I justified that? With all this justification finally out of the way, I bought Steve the Ring Alarm for Christmas. I started with a big combo pack from Costco which was a much better deal than buying all of the pieces separately. The current price at Costco for the 10-piece kit is $240. That gets you the hub, keypad, range extender, motion detector, and 6 contact sensors. Amazon owns Ring now so I’ll also give you a link to the starter kit on Amazon. For $200US, you get the hub, keypad, one sensor, and a motion detector. Talk about a starter kit, who has one window or door? We needed 14 sensors, 2 keypads (and will probably buy a third). Your needs will vary of course from mine. I ended up buying 8 more sensors, and the extra keypad directly from Ring for another $300. Ring does have lots of different combo kits, up to and including a 14-piece kit but oddly they’re only available at ring.com. My grand total for all the pieces I bought was $540, which isn’t a small expense. I priced out the same combination of devices on Simplisafe and it came out to $500, so the price is pretty much equivalent. Remember, Ring Protect Plus’s recurring cost is only around $8/month which is around half what you’d pay for Simplisafe’s monitoring. So I’ll still be ahead over time. Okay, enough about costs, how does it work? 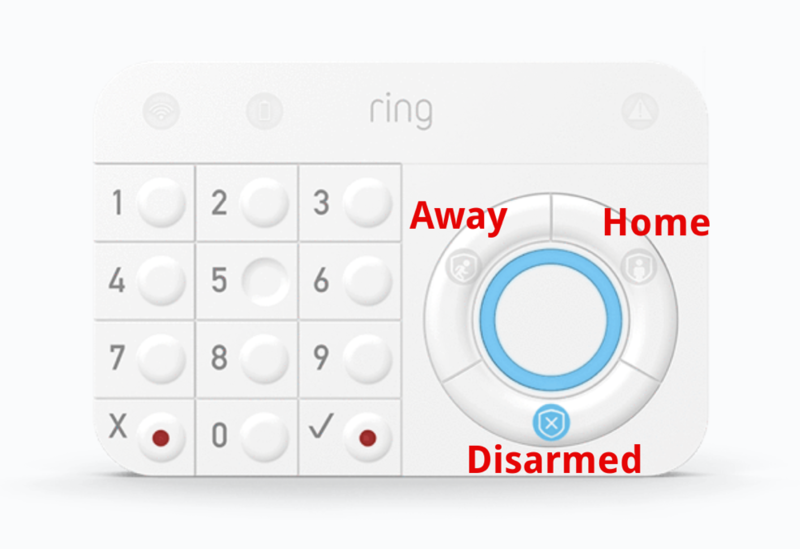 Ring has three different modes to the alarm system. The keypad has a ring with three buttons at 60° apart around the ring. We put labels on them because the icons weren’t all really meaningful and because the ring lights up BRIGHT RED when you’re trying to disarm it, and the glow is so bright you can’t see the icons at all. The first mode is called Disarmed. Disarmed is pretty obvious, it means you can open any door or window and the alarm won’t go off. However, the Ring software lets you designate some doors as “main doors”. When a main door is opened, the hub that you’ve connected to your router lets off this very pleasing “boop boop” noise, even when the house isn’t alarmed. Let me give you a problem this solved. Shortly after we set up the Ring Alarm, I tried to convince our dog Tesla to go outside. I opened the back door but since it was raining and she’s a California girl, she refused to go out. I shut the sliding glass door and went upstairs. I was playing on my computer when I heard the hub in the next room go, “boop boop”. Well, wait a minute, Tesla was right next to me and Steve was at the store. I knew exactly what had happened. My idiot cats Ada and Grace must have opened it! I raced downstairs and sure enough, both cats are frolicking outside in the rain! I’m sure I must have slid the door almost closed, enough that the sensor was engaged, but had left a crack just small enough for a tiny cat paw. I can only figure they both pulled on the door together to drag it open! In any case, you get how this works. My only wish is that the little “boop boop” could be heard throughout the house, but the noise only comes out of the hub that’s upstairs plugged into our router. The Ring doorbell and cameras have a little Chime that goes off when they sense motion, why can’t those Chimes (or a device like it) make the “boop boop” noise for me too? Armed is the second mode. When the Ring is armed, if any window is opened, the alarm will go off immediately. This is also true of doors that are not designated as Main Doors. If a Main Door opens, you get a 60-second delay before the alarm will go off, giving you time to type in your code. When the house is Armed, the motion sensor will trigger the alarm as well. This is so that if someone breaks a window but never opens it, you’ll still know you have an intruder. We have a relatively large dog and two cats, so we had to set the sensitivity down pretty low. They don’t trigger it when the house is Armed and we’re away. The third mode is called Home. This is a mode to protect you when you’re home. In this mode, the Main Doors still have some time to be opened and let you disarm the alarm, but if a window or non-main door is opened the alarm goes off immediately. The main difference between Home and Armed is that in the Home mode, the motion detector does not trigger the alarm. That makes sense, right? You want to be able to wander around your own home. Ring offers free monitoring for the first month, but we spent the entire month testing scenarios, figuring out what more we needed to buy, and making sure we had everything configured properly. We’ll be turning it on soon, but in many places there’s an additional step. I’m not sure if this is a California thing or a nationwide thing, or a global thing, but we have to get a permit from the city to have monitoring. With monitoring, if your alarm goes off, they try to call you on the phone. If you don’t answer, or disarm the alarm, they call your backup phone number. If you still don’t answer with the secret answer, they call the police. You can just imagine that false alarms are a problem, even with basically three chances to disarm the alarm or prove you’re you. I’m not sure what the permit does to discourage false alarms, or what it does to ensure the police actually come to your home. Are they going to go look up your permit in their files before sending the police? If they don’t find a permit, are they going to refuse to send the police? In our city, the permit paperwork isn’t available electronically so I can just picture a clerk fishing through paper records as my house is ransacked! The cost of the permit can vary wildly. Our city charges $33 and it’s good for 3 years, but Pat Dengler who lives about 10 miles away is being charged $48 and you have to renew every year. That’s half the cost of the monitoring service itself! Again, not sure what that fee is for exactly, but we all followed the rules. There’s one more thing to consider in deciding whether you want to incur the expense of a home alarm system. It turns out that some insurance companies in some areas give you a discount on your home owner’s insurance if you have a security system, especially one that’s monitored. I don’t want to disclose the value of my home, or the cost of my insurance, but the discount to us pays off the cost of the purchase in 2.4 years, and after that, we actually save money by having a monitored alarm system. 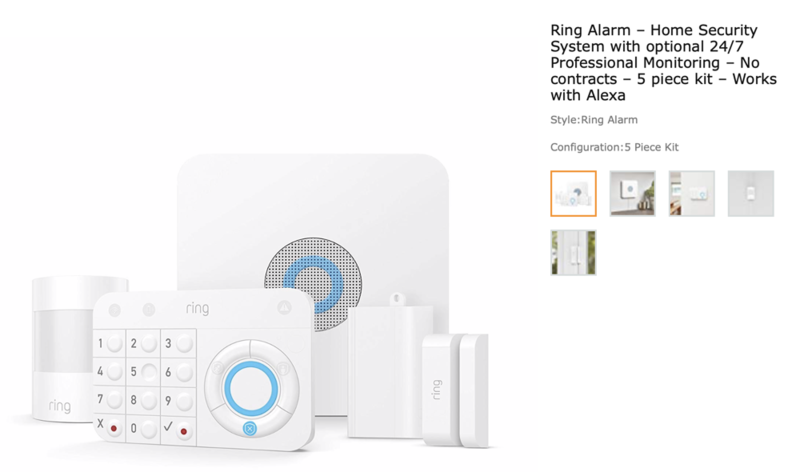 The bottom line is that the Ring Alarm System has a competitive purchase price, is really inexpensive for home monitoring, and it has modes to keep you safe while you’re home and keep your stuff safe when you’re away. We did have to have a contractor come back to do some work, and it was awesome that we were able to not only unlock the door for him but also disarm the alarm remotely. I think we’re happy with the Ring system, and if for some reason we aren’t happy with the monitoring, I’ll be sure to let you know! I’ve mostly avoided the “Smart Home” IoT trend so far, but I do have 3 Blink and 2 Wyze security cameras (no monitoring) scattered around the house, and a Honeywell MyQ control for my garage door monitoring. I’ve tried a few lightbulb controllers but haven’t found a problem to solve for this yet. Why is offsite monitoring/video storage necessary? I get an immediate alert whenever a camera triggers and within seconds am looking at the view. Blink provides a small amount of free video storage and so does Wyze so I can view any recordings for several days if needed. If someone was in my house, I could just dial 911 to alert the police. Monitoring seems unnecessary for me at this point in time. What am I missing? Rick – I see your point and that’s not unreasonable. With the alerts you know if someone broke in, but nothing happens as a result. With home monitoring, if the alarm goes off and we’re not there, the monitoring service calls us. If we don’t disarm the alarm or give them the magic keyphrase, they call the police. Second scenario is we ARE home and someone breaks in. Again they call us and if we don’t give the magic keyphrase (becuase we are being attacked) they call the police. You _might_ be able to call the police yourself, but maybe not. Thanks Allison. I can see scenario two justifying the need for automatic monitoring. It’s great to have so many affordable options. I can remember having an alarm company salesperson come to my house 20+ years ago trying to sell me on a basic alarm system (all wired at that time) for about $4500. It did not include monitoring at that price, but did include a sign for the front lawn announcing that we had an alarm system to deter burglars. I asked her how much for just the sign, and she answered, “$4500”. She was obviously well trained. I sent her on her way. Glad those days are over. Oops. Forgot to add my name to above post!